Abstract: A positive step pressure generator suitable for the dynamic calibration of ballistic pressure transducers is described. The device uses a hydraulic system to generate pressures up to 150,000 pounds per square inch and is capable of delivering pressure steps in one millisecond or less. Final pressure step values can be traced to conventional deadweight calibration figures with an accuracy of 0.2% by using a transfer standard (static reference gage). Among the uses for the device are examining transducer response characteristics to rapid positive pressure steps and comparing the relative response behavior of several transducers to a common pressure step. Although ballistic pressure transducers (gages) are used to measure dynamic events which occur in milliseconds, the determination of their response characteristics is routinely limited to static calibration against a deadweight pressure standard. The strength of this method is that the deadweight device is a primary standard. Its weakness lies in the assumption that the static and dynamic responses of the gage in question are equivalent. Differences in gage response to static and dynamic events, however, can lead to serious measurement errors. There has been general agreement in the measurement community that dynamic techniques are needed to supplement current static calibration methods. Several techniques have been developed to address this problem. 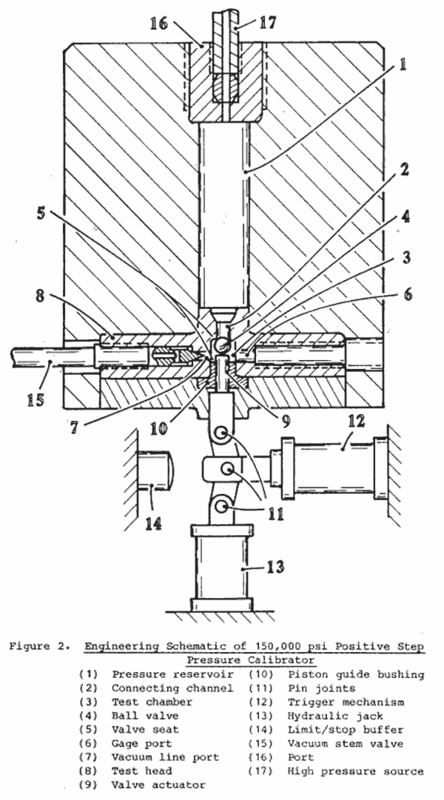 In one version of this technique, the gage is mounted at the end of a tube in contact with a hydraulic fluid confined by a movable piston. The tube guides a projectile which impacts the piston to create a pressure pulse in the fluid. Different pressures may be achieved by varying the compressibility of the fluid, the mass of the piston, and the mass and velocity of the projectile. 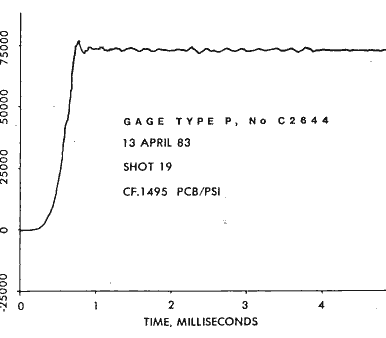 The pulses rise within milliseconds and mimic the characteristic rising and falling of a ballistic pressure pulse. One such device, capable of operating to a pressure of 100,000 pounds per square inch, is operational at the Combat Systems Testing Activity (CSTA), Aberdeen Proving Ground, Maryland. This method is quite useful for dynamic comparison of several different pressure gages; however, variations in projectile velocity, frictional effects on the moving piston, and other energy losses make it difficult to accurately compute the actual delivered pressures. Because a projectile is fired during the calibration process, this method requires more extensive safety provisions than are readily available in most laboratories. Two general approaches of shock tube calibration are followed. In the first, the test gage is mounted in the end wall of a tube and subjected to a reflecting shock wave. The gage output is monitored as the shock front arrives at and reflects from the end wall. 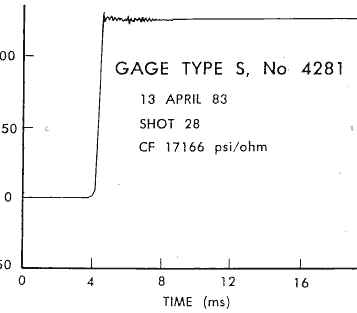 In the second approach, the gage is mounted in the side wall of the tube and its output is monitored as the shock front passes. Both methods generate rapidly rising pressure pulses that are readily calculated by thermodynamic principles using velocity measurements and gas properties. Shock tube methods are useful in establishing the dynamic response characteristics of pressure gages. However, calibration is generally limited to pressures below 1000 pounds per square inch, whereas ballistic applications require far higher pressures. In this technique, the gage is exposed to a given pressure under static conditions using a hydraulic fluid. The pressure on the gage is then relieved using a fast acting dump valve, bringing the system to atmospheric pressure. The gage output obtained during the depressurization is assumed to be the inverse of the corresponding positive pressure step. This method’s strengths include its relative simplicity and suitability for use in calibration facilities. The response of the negative step calibrator can be very quick, 100 microseconds or less. 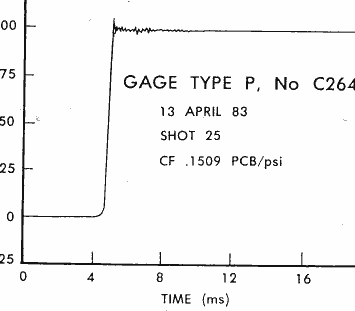 However, the major assumption, that the positive response of the gage is equal and opposite to the negative response of the gage, is not completely accurate; pressure preloading of the gage-to-mount interface and hysteresis can cause significant differences between the pressurization and depressurization pulses. In this technique, the gage, initially at atmospheric pressure, is subjected to a pressure increase by the opening of a fast-acting valve. Because the final pressure value is held, the method is suitable for obtaining calibration response data. Although this technique holds a great deal of promise, the engineering details of creating a working device can be formidable. Johnson and Cross of the National Bureau of Standards had desi9]ed a 50,000 .gounds per square inch step calibrator in the 1950’s. Smith and Dykstra described low pressure versions of this device. These calibrators were successfully used to generate positive pressure steps up to 5000 pounds per square inch in less than one millisecond. Building on these ideas, we have developed a device capable of generating precisely known positive pressure steps up to 150,000 pounds per square inch in less than one millisecond. The step calibrator may be safely operated in a laboratory environment and can compare the response of several transducers to a common pressure step. Additionally, it is economical to use as a routine laboratory tool for gage calibration and screening. The discussion that follows describes the pressure step calibrator and presents several examples of its operation. Figure 1 illustrates the basic configuration of the device, details are given in Figure 2. A large pressure reservoir is connected to a much smaller test chamber by a fast acting ball valve. The test chamber is equipped with several gage ports and a vacuum port which aids in filling the reservoir and setting the baseline chamber pressure. The large ratio of reservoir to test chamber free volume reduces overall system pressure drop while generating the pressure step. Reservoir pressure is provided by a conventional hydraulic high pressure panel and monitored by a high quality static reference gage. The maximum operating design pressure is 150,000 pounds per square inch and the specified action time (10%- 90% of peak pressure) is under one millisecond. Outputs of both the static reference gage and the ballistic test gages are monitored during the course of the test. The final steady state output of the reference gage is taken as the true value of the pressure step maximum. The short- and long-term monitoring of the test gage outputs establish the relationship between dynamic and steady state response behavior. The device, illustrated in Figure 2 thru 4, consists of a large pressure reservoir (1) opening into a short wide channel (2) which terminates in a very small cylindrical test chamber (3). Located in the test chamber (3) is a ball valve (4) which provides a high pressure seal at either of the valve seats (5) located at each end of the test chamber (3). Located in the side wall of the test chamber (3) are four gage ports (6) and one vacuum line port (7). The channel (2), test chamber (3), gage ports (6) and vacuum line port (7) are contained in the test head (8), a monolithic assembly shown in lateral cross section in Figure 3. The test head (8) is readily removed from the assembly, allowing changing of the gage ports (6) and the test’chamber (3). The ratio of the reservoir (1) volume to the test chamber (3) free volume is 197:1. The channel (2) is kept short and wide to minimize retardation of fluid flow during the operation cycle. The end closure of the test chamber (3) is formed by the ball valve actuator piston (9) and the piston guide bushing (10). The piston is actuated by a quick release top-dead-center mechanism which consists of three pin joints (11), an air controlled trigger mechanism (12), a hydraulic jack (13) and a limit stop/buffer (14). The system shown in Figure 2 is in the cocked position with the ball (4) pressed against the seat (5) that isolates the test chamber (3) from the reservoir (1). The jack (13) is pressurized to provide sufficient force to seal the reservoir (1) from the test chamber (3). The ratio of reservoir (1) pressure to jack (13) pressure is approximately 100:1. 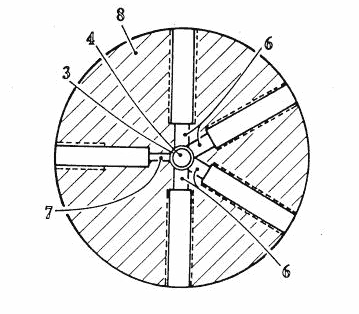 A hollow stem valve (15) connected to a vacuum/drain line is located at port (7). A high pressure line (17), (Figure 2), is connected to port (16) at the upper end of the reservoir (1). This line connects the pressure generation system to the measurement system. Prior to operation, both the test chamber and reservoir are filled with fluid at ambient pressure. During pressurization the reservoir is sealed off from the test chamber. The actual movement of fluid through channel (2) is minimal, consisting of the volume required to displace the movement of actuator piston (9) in the test chamber ( 0.2 cc) and the amount due to compression of the fluid originally in the test chamber. Figure 4 shows the device after the trigger mechanism (12) is released. The trigger (12) forces the middle pin joint of the top-deadcenter mechanism against the limit stop/buffer (14), relaxes the force generated by the jack ( 13) and withdraws the ball valve actuator piston (9) into the piston guide bushing ( 10). 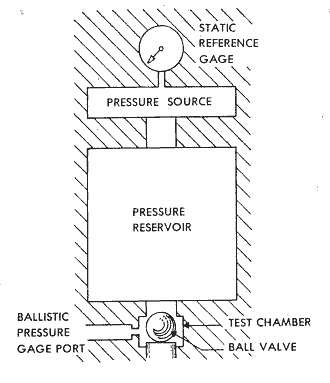 Differential pressure between the reservoir (1) and the test chamber (3) forces the valve ball (4) against the lower seat (5) on the piston guide bushing (9). This action forms a new seal at the piston end of the test chamber (3) and allows fluid to flow from the reservoir (1) to the test chamber (3) causing the pressure in the chamber to rise to approximately 98% of the original reservoir pressure. Starting with a drained system, the top-dead-center mechanism is placed in the release position as shown in Figure 4. The high pressure line (17) is closed off and the vacuum valve (15) is opened. Gages are mounted in the gage ports (6), the system is evacuated to a pressure of 2 Torr and the vacuum valve (15) is closed. A 50% solution of water and glycol with a rust inhibitor enters the system through the high pressure line (17). Liquid is used rather than gas to minimize the level of stored energy. 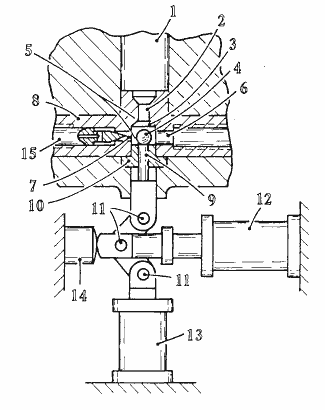 When the system is filled and stabilized at atmospheric pressure, the top-dead-center mechanism is cocked as shown in Figure 2. The hydraulic jack (13) is pressurized to approximately 1% of the desired reservoir pressure. Monitored by the static reference gage, the pressure generation system pressurizes the reservoir (1). Once the desired reservoir pressure has been established, the high pressure line (17) is closed off from the standard gage and the pressure generation system by a constant volume valve. The device is now ready to be triggered. Activation of the top-dead-center mechanism shown in Figure 4 initiates the event and the recording system. Pre-trigger delay features permit the recording of initial baseline pressures, the rising portion and final steady state values of the pressure-time curve. One gage with exceptionally good response charcteristics and known history is used as an informal laboratory standard. 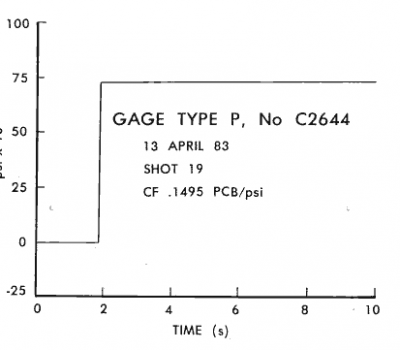 The output from this gage is monitored .for at least 10 seconds after the trigger event to observe system behavior, particularly possible pressure losses from leakage. Soon after the system is triggered, the constant volume valve to the static reference gage is reopened and the reservoir pressure measured. Thus, the speed of the step can be measured using the timebase of the recording system and the magnitude of the dynamic response can be checked against the response of the static reference gage (a secondary standard). At the completion of the test, the top-dead-center mechanism is recocked, the test chamber (3) is drained through the vacuum valve (15), and the pressure is relaxed in the reservoir (1). The gages can now be replaced for further testing. Examples of both short- and long-term responses of a commercial piezoelectric pressure gage to a positive-going pressure step are presented in Figures 5 thru 8. 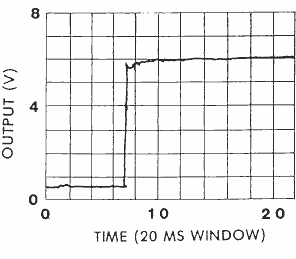 Figure 5 shows a typical pressure versus time history for a 75,000 pounds per square inch pulse acquired over 10 seconds. Monitoring the test gage response for 10 seconds allows correlation to the steady state response of the static reference gage. Figure 6 shows a 20 millisecond window of the same 75,000 pounds per square inch pulse; Figures 7 and 8 present progressively shorter windows. Overlaying the traces indicates that the steady state value of the pressure step is rapidly achieved and held after initial oscillations have died out. Similar oscillations have been reported in lower pressure devices by both Smith and Dykstra; one may conclude that these oscillations are caused by actions within the pressure generation system and the mount, not by the gage itself. One important application of the step calibrator is comparing the responses of different types of pressure gages to the same input. Figures 9 and 10 show the pressure versus time histories of both a piezoelectric gage and a strain-type gage measuring a positive-going 100,000 pounds per square inch pressure step. The traces are virtually identical, exhibiting initial system oscillations which quickly decay. The calibrator may also be used to analyze the behavior of experimental gages. by comparing their output with a known standard. Figure 11 shows the pressure versus time history of a developmental pressure gage subjected to a 125,000 pounds per square inch pressure pulse. This curve exhibits, as expected, a smooth pressure rise and stable output after the peak pressure has been attained. The positive step calibration device in conjunction with conventional deadweight calibration methods can be useful in tracing dynamic gage response problems. 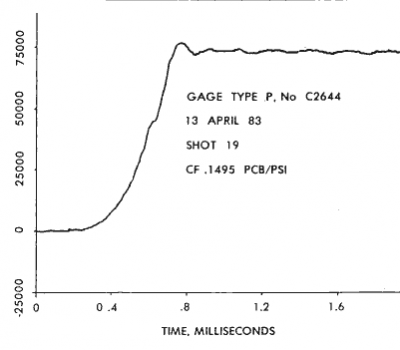 Figure 12 exhibits the pressure history of a developmental pressure gage exposed to a 130,000 psi pressure step. The trace indicates a·clear upward drift after the step is complete. 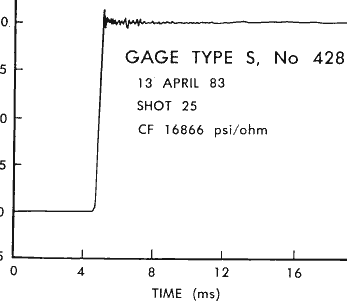 The same gage had exhibited good response behavior on static calibration using the deadweight system. In gun tests, however, the device read five percent low. From the dynamic calibration tests it became clear that it took tens of milliseconds for the gage output to reach a maximum. This could not be detected by the static calibration technique. In point of fact, on dissecting the gage it was found that the bond between the strain patch and the gage body was faulty. The defect of the type noted could well account for the differences in static vs dynamic behavior noted in testing. The positive-going step calibration device described allows the accurate, safe and simple dynamic calibration and evaluation of ballistic pressure gages. 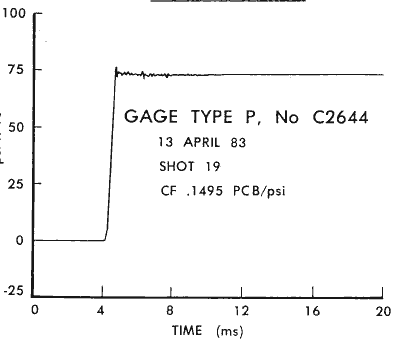 The gage response obtained can be related to its static deadweight behavior. Several gages may be evaluated simultaneously relative to a common dynamic event. The calibrator may also be used as a diagnostic tool in analyzing and developing experimental pressure gages.